This image released by World View on June 23, 2014, offers a glimpse of the view the company's "Voyagers" will be treated to during flights to 120,000 feet. A new video gives an extended look at the record-breaking first test flight by a company that aims to begin lofting passengers on balloon cruises to near-space by 2016. 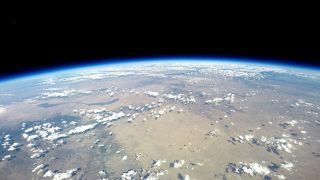 On June 18, Arizona-based World View launched a scaled-down version of its balloon system to an altitude of nearly 23 miles (37 kilometers) during a test flight that originated in New Mexico. The new World View balloon video of that unmanned flight, which the company shared with Space.com today (July 15), reveals some spectacular views of Earth from the stratosphere. Workers fill a balloon on June 18, 2014, during the lead-up to the first test flight by Arizona-based company World View, which aims to start carrying passengers on near-space cruises by 2016. "Our voyagers will look out this enormous window at this spectacular view of our planet — the curvature of the Earth, that thin blue line against the backdrop of this beautiful starscape, the blackness of space — that really only astronauts have seen until now," World View CEO Jane Poynter said in the 5.5-minute video. "And now, we get to go." World View first released a test-flight video about a week after the June 18 launch, but the new video is 4 minutes longer and more in-depth. Last month's 5-hour test launch ended with a parafoil — a parachute-like wing — carrying the flight system back down to Earth from an altitude of 50,000 feet (15,000 meters). That set a record for the highest-ever parafoil flight, company representatives said. The test marked a big step forward for World View and its quest to carry paying customers, Taber MacCallum, the company's chief technology officer, said in the video. "We began working on World View in 2011, and we'd tested components of the system at a smaller scale leading up to now," MacCallum said. "But this was the first time that we'd sewn all of the different parts of a full flight together." "This is when we transition from engineering to safely flying people on the edge of space," he added. World View isn't the only company in the space-tourism field. Virgin Galactic is developing a six-passenger suborbital spaceliner called SpaceShipTwo, and XCOR Aerospace is working on a one-passenger suborbital rocket plane called Lynx. Tickets to ride SpaceShipTwo are currently selling for $250,000, while a seat aboard Lynx costs $95,000. Both vehicles could begin commercial operations within a year or so, company representatives have said. World View, meanwhile, is aiming to loft its first customers on 2-hour sailinglike excursions in 2016.